Not your grandmother’s bingo anymore. Win using our electronic tablets. You play against the house and you can play anywhere on the ship, even while gaming at other locations. 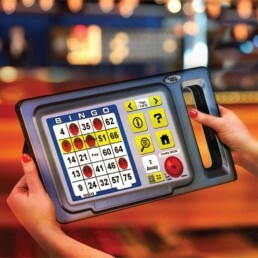 Bingo is played using handheld bingo tablets, available at the Bingo Kiosk at Big Norm’s Club V on Deck 4. Guaranteed $1000 payout if you cover all 25 numbers in 55 balls or less on a card!